I have the best mom in the world! She is wonderful for so many reasons, but her love of helping others (especially her kids) is amazing! She's probably the biggest fan of my blog, and I know she worries about me keeping up with it. And since she doesn't want me to stop blogging anytime soon (it is a great connection when we're a bit far apart), she's always giving me recipe ideas to help me out. Last time she came to visit she brought a notebook with several fall recipes, and the groceries to go with them so I could easily make them. See! She's the BEST! I keep thinking I've made every apple-related recipe on the Earth, but she proved me wrong. She left two apple recipes, and I'd never made either. 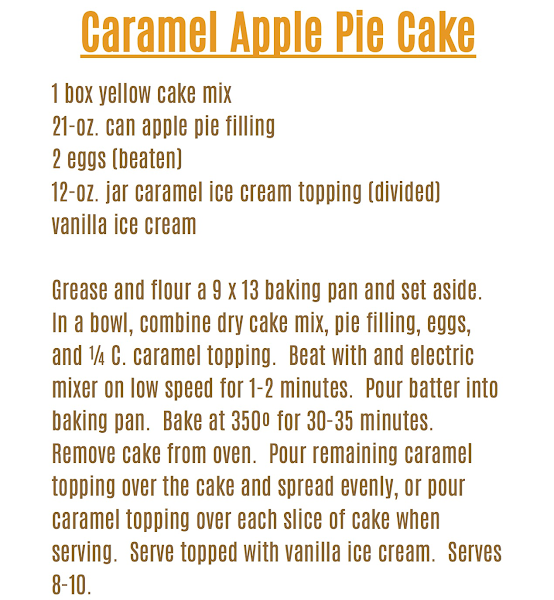 So, today I have the caramel apple pie cake to share, and next week I'll share the other recipe she left (apple butterscotch bars!). This cake comes together so, so quickly. I didn't pour the caramel sauce over the cake after it baked, I just poured it on each individual piece of cake as I served it. I knew we'd had leftovers, and I wanted to cake to keep a bit better, so that's why I left the caramel off the entire cake. But go ahead and try it! I'm sure it's delicious, moist, and it probably would keep just fine. 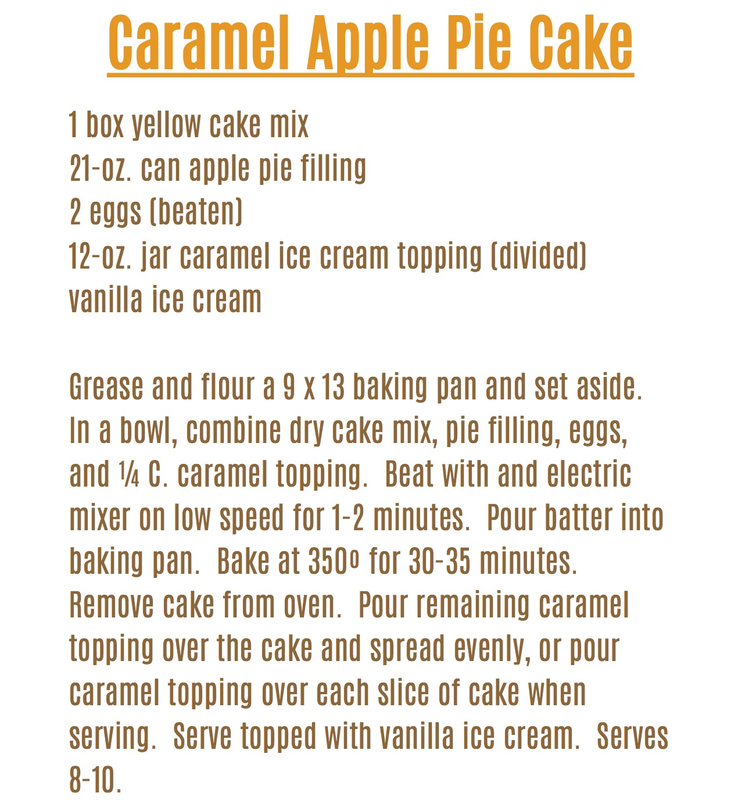 So, if you're in need of a quick apple dessert any time soon, give this cake a try. It was a big crowd-pleaser with my family (in-laws included) the other night. 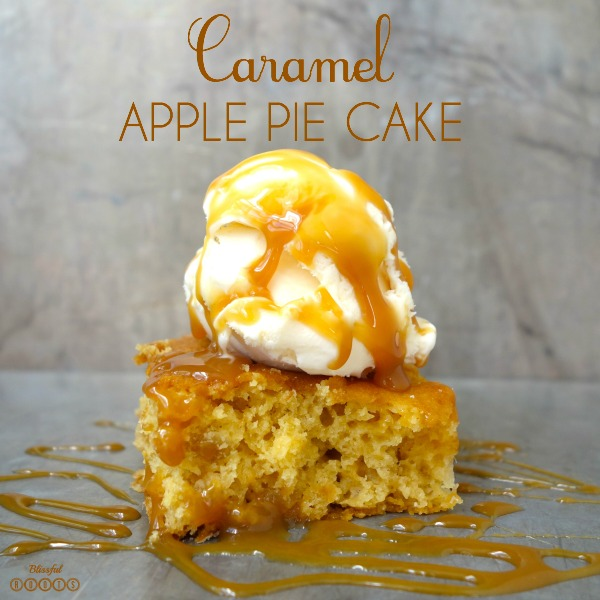 And here's another delicious, favorite apple recipe I make every fall. 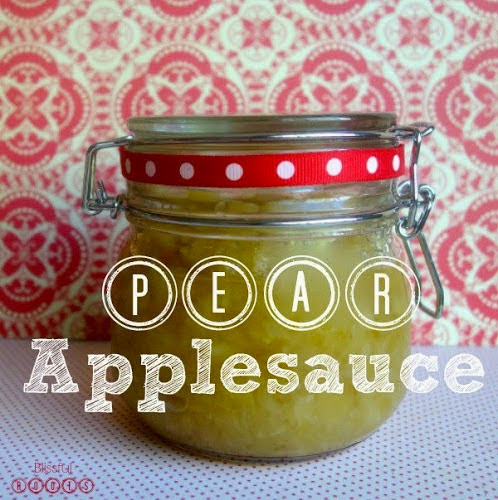 Homemade pear applesauce. Pears have been amazing here in Utah these past few weeks, and they add an amazing flavor to the already delicious applesauce! This sounds divine. 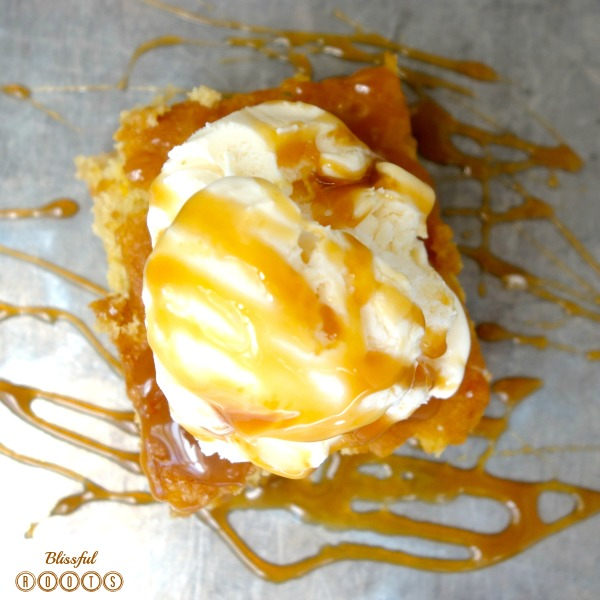 I am looking for fall recipes that are not pumpkin (not that I don't love pumpkin - just looking for a little variety) and this is perfect!! It is incredibly delicious, and so easy. I am a huge apple pie fan, but don’t always have the time to make one. This is the perfect substitute! Thanks so much for visiting! Enjoy your day! Brooke...moms ARE the best! And this cake looks amazing. Your photos are great, too! :) Pinned, tweeted, and added to my fall must-make list! Have a good weekend! Thanks so much for stopping by to visit, Blair and for your kind words! Enjoy the cake. I promise it won’t disappoint! تؤسس الملكة المُخصبة مؤخراً مملكة لوحدها تضع بيوضها فيها وتعتني بها جيداً وذلك المنتشر.